Being a mother is hard. The list of things that need to be taken care of is endless. The concern for our children is constantly on our minds and our love for them consumes every bit of us. So, I know what you are thinking when you see this list. WHO HAS TIME TO READ?! The books I’ve collected for this list are practical for moms, short daily readings, resource books, small reflections, and calls to action in our homes. Even the busiest moms can take a few minutes each day with some of these books. We have been entrusted with such an important vocation. Let these books bring you closer to Jesus, his mother, and help lead our children to Him as we grow. The Catholic Mom’s Prayer Companion: A Book of Daily Reflections is a wonderful prayer book for daily reflection. Each day provides a short reflection and prayer. It ends with something to reflect on or provides one simple act for moms to try to complete during the day. The lovely thing about this book is that each reflection speaks to the vocation of motherhood and I often find much comfort in similar feelings and situations shared in the book. The Original Mother’s Manual was a gift to me from my mother and she received it from her mother-in-law. It is by far my favorite prayer book. There is a prayer for everything in here. Prayers for marriage, childbirth, nursing, child’s companions, child’s studies, and sick children just to name a few. Each prayer is beautiful and offers me comfort each time I open it. It is my constant companion. Small Steps for Catholic Moms is a great book for moms who are too busy to sit down for long periods of time to pray. The book offers short thoughts to reflect on, a quick prayer, and an action to try to carry out during the day. It’s great way to start your morning before the kids wake up. Our Lady, Undoer of Knots: A Living Novena, is an old novena that has recently been “revived” through the efforts of Pope Francis. Who doesn’t have “knots” in their lives? This novena, also known as the “unfailing novena”, is a beautiful way to pray for the difficult situations in one’s life. Mary’s Way: The Power of Entrusting Your Child to God is for those moms who struggle with raising their children through the difficulties (suicide, cancer, unwed pregnancy, drug addiciton) in life. The author takes you through meditations on Mary and her loving ‘yes’ to God. Ultimately, it will leave moms more peaceful and more powerful intercessors. Feeding Your Family’s Soul is a great way to ensure your family has time to discuss the Catholic faith in the busy world we live in. Today’s families find it hard to sit down together when they have so many outside obligations, yet this is a special time for most families. This book provides 52 topics to be discussed during dinner. There’s one for each week of the year and works really well with kids in elementary school through high school. Passing on the faith is so important. This book will help get those discussions started. The Catholic Catalogue is an awesome resource full of ideas to help make your home a Catholic home. It includes activities like planting a Mary garden, blessing your house, and the creation of sweet traditions for your family. It’s sweet and simple and positive. We and Our Children: How to Make a Catholic Home is a wonderful reminder that everything we do becomes a lesson for our children. While still focusing on building a domestic church, this book focuses on the every day and uses the little things to help guide and mold our children into a deep relationship with God. I’ve written about Divine Mercy for Moms: Sharing the Lessons of St. Faustina before, but really I can’t recommend it enough. By studying what Jesus revealed to St. Faustina about his Divine Mercy, I have grown in my motherhood. Who knew that we can practice Divine Mercy every day in our own home? A reiteration of the importance of the job of a mother, this book is reaffirming to our vocations. You can read more of my review here. The Corporal Works of Mommy (and Daddy Too) is just another great book that reminds us of all of the works of mercy we do with our children each day. Often, I feel concerned that I am home with my littles and can’t afford much time out working with different ministries, but this book reminds moms of our greatest ministry, being a mom and passing along the love of God and the faith to our children. You can read a full review here. The Domestic Church: Room by Room: A Study Guide for Mothers is a book designed for moms to read as a group. This is a great book for a prayer group of women or a few friends to read and discuss the difficulties of the vocation of motherhood. Filled with encouragement, it focuses on finding joy in the seemingly mundane tasks moms must take care of every day. Imitating Mary is a wonderful reminder that Mary is the ultimate model of what motherhood looks like. 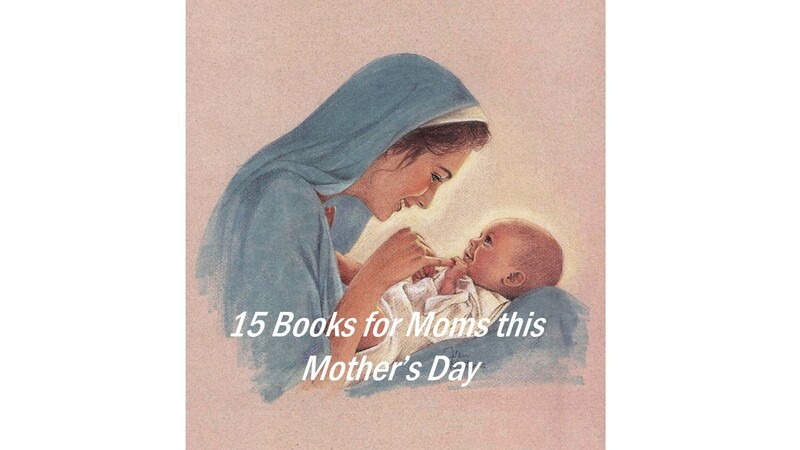 This book helps moms to reflect on ten of Mary’s mothering virtues by focusing on some major events in her life and her human feelings. As we reflect on her incredible fiat, we are called to become more like her in our daily. A Catholic Mother’s Companion to Pregnancy: Walking with Mary from Conception to Baptism offers a weekly reflection for mothers as they journey through their pregnancies. Each week focuses on a different mystery of the rosary and helps moms prepare for childbirth, baptism, and the raising of the child. 10 Ultimate Truths Girls Should Know is really a book for your pre-teen and teen aged daughters, but it is also an excellent resource for you. The teen years can be difficult because of peers, society, and just the normal self-discovery of growing up. Kari Kampakis discusses ten truths that a girl should understand so that “when she discovers God’s purpose, she can live her best life possible.” The truths cover subjects such as: popularity, reputation, perseverance, patience, image, and God’s plan. There are every day examples that illustrate the difficulties and joys girls face, quotes from the Bible, and even discussion questions at the end of each chapter. I highly recommend this book to any mother of girls who are learning to be strong and holy woman.